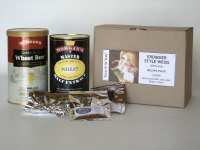 Recipe Packs are the next step in no-boil kit brewing. Depending on the recipe, they contain various combinations of beer kits, malt extracts, brewing sugars, beer finings, specialized yeasts and generous amounts of noble hops to create an entirely different class of beer. Not included are cleaning and sterilizing agents, carbonation tablets or drops and crown seals. A flavourful wheat beer, reminiscent of the famous German Erdinger Kristallweiss. Estimated ABV: 4.7%. 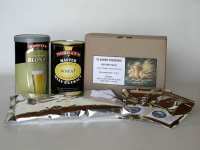 Contents: Beer kit, liquid malt extract, specialized yeast, noble hops, beer finings and recipe. Makes 20 liters. Note: fermentation temperature will have a significant effect on the flavour of this beer. The beer should ferment between 18 and 24 degrees Celcius. At the low end of this range the beer will have more clove-like flavour notes, while at the high end there will be more banana in the flavour profile. Temperatures between 18 and 24 degrees Celcius will produce a mixture of the two. A double chocolate stout with heavy notes of roasted malts and dark chocolate. Estimated ABV: 5.3%. 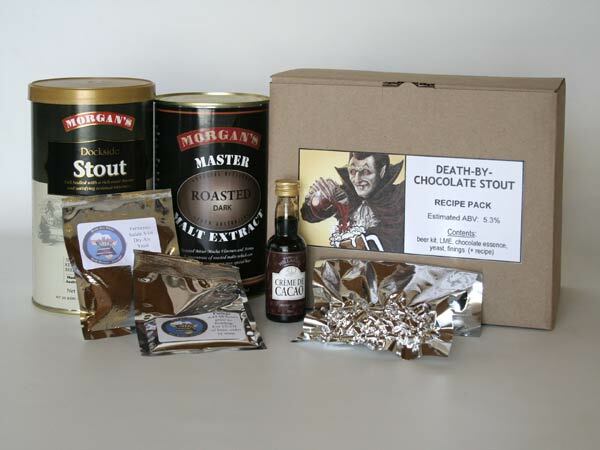 Contents: Beer kit, liquid malt extract, chocolate liqueur essence, specialized yeast, beer finings and recipe. Makes 20 liters. A light bodied Belgian pale ale. This full-flavoured beer balances malty sweetness with spicy notes in the typical tradition of Belgian beers. Estimated ABV: 6.5%. Contents: Beer kit, liquid malt extract, brew blend, specialized yeast, noble hops, beer finings and recipe. Makes 20 liters.